OCEANSIDE — While many of us find ourselves bundled up in sweaters on a chilly late autumn day, young Caitlin “Caity” Simmers prefers hitting Oceanside’s waves on her trusted Borst Designs 5-foot surfboard. At 13 years old, Caity — the daughter of an electrician and a hospice nurse — is making quite a name for herself in the surfing world. In November, Caity was named as a finalist for Sports Illustrated Kids’ “SportsKid of the Year.” She was chosen along with five other young athletes by the Sports Illustrated Kids staff for its 11-year-old awards program. The seventh-grader, who is homeschooled, said she tries to surf daily whether it’s warm or cold outside. Like a fish out of water, she mentioned she has an array of wetsuits she can pull on before hitting the waves in her hometown when the temps dip. While she’s riding the waves, Caity also likes to perform cool aerial stunts on her surfboard perfected with the help of her skateboard. Caity said she typically goes surfing with her dad, Jesse; however, you might see her take a wave or two with her mom, Ali, or younger brother, Timothy, 11. Earlier this year, Caity ranked No. 1 in the girls’ Under-16 West Coast Prime Series and earned the National Scholastic Surfing Association’s 2018 Rookie of the Year after scoring three perfect 10s at NSSA nationals, a first in the event’s history. 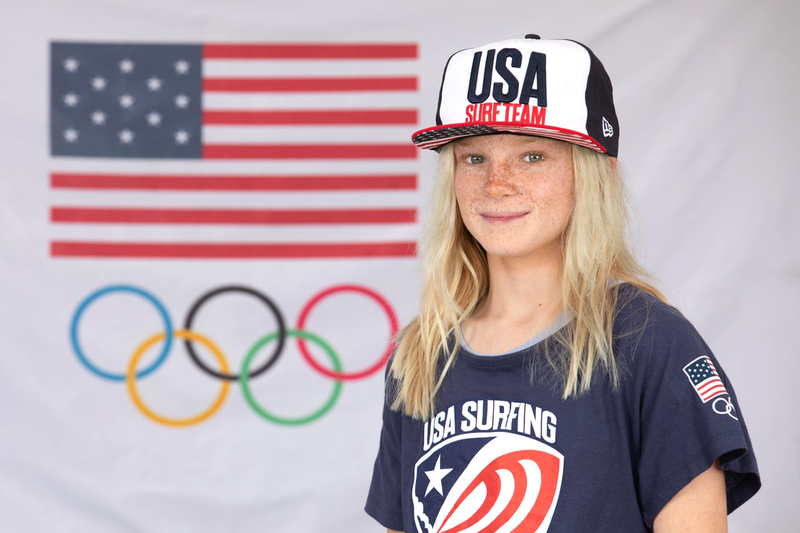 And if that wasn’t enough, she also helped Team USA land a bronze at the International Surfing Association World Surfing Games in Japan and won gold in the under-16 girls division at the ISA World Junior Surfing Championships. “I started surfing when I was 6 or 7 years old in Oceanside, but I was actually Boogie boarding. I decided to stand up, but on a real surfboard; my dad taught me,” she said. And if you thought being a girl stood in her way, think again. “Being a girl does not make me feel like it is harder to excel,” she said. She’s also humbled by all the contests and events she has participated in and won. “I feel happy with my results at the recent contest, but I’m just trying to go one heat at a time, and just have fun,” she said. Already a superstar among many of her surfing peers, Caity said her close friends don’t treat her differently. “ … they know that I don’t want my surfing to define me, I just want them to see me as a normal, and I’m happy that they do that,” she said. But she’s also proud of Team USA. Caity said she’s been working on her “air-game” for a while and hopes to master it and take it to the contests. Other things the teen enjoys include basketball, art and having fun. She said her personal favorite surfers are John John Florence and Dane Reynolds. Her family is equally proud of her efforts: “My husband and I are so proud of Caity, she is so focused and determined on achieving her goals and we want her to continue to thrive doing what she loves,” Ali Simmers said. The nominees for Sports Illustrated Kids come from submitted nominations, recommendations from Team USA coaches and from previous winners of the magazine’s “SportsKids of the Month” program. For more information about the nominees, visit sikids.com.